On June 20, 2018, RedBox+ Franchising, LLC completed their acquisition of redbox+, the nation’s first and only roll-off waste container and portable restroom franchise. As part of this acquisition, RedBox+ Franchising, LLC will retain all current redbox+ employees/staff members and independent contractors who will provide ongoing support to new and existing franchisees. The unique, patented redbox+ design is an efficient and effective accommodation for construction sites. In fact, this is a mandatory accommodation in the many towns and municipalities across the country where a portable restroom is required by law when a roll-off container is on-site for contractors to use. 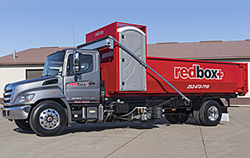 redbox+ franchise operators offer the industry’s only solution for construction site operators eager to make one call for two critical services/products – roll-off waste containers and portable restrooms. After building Monster Tree Service, the nation’s first and only tree service and removal franchise, into one of the nation’s fastest growing franchise systems, Josh Skolnick launched RedBox+ Franchising, LLC to acquire redbox+ and take over as the company’s CEO and majority owner. When he reviewed the numbers, Skolnick was impressed by redbox+’s semi-absentee business model. He says he’s confident the concept will appeal to aspiring business owners interested in multi-unit/multi-territory franchise opportunities offering serious scalability and profitability potential. redbox+ was founded in 2006 by Jeff Matejka. It all began with a simple, hand-drawn sketch of what would become the patented redbox+ design. After obtaining an exclusive U.S. patent for the combined roll-off waste container and portable restroom unit, redbox+ experienced rapid customer growth. In 2007, redbox+ received the “Innovation of the Year” award during the International Waste Expo. RedBox+ Franchising, LLC is working to sustain controlled franchise system growth through expansion into new territories. In the next 12 months, the franchise aims to open 100 new locations. If you’re interested in learning more about redbox+, here is a video that displays franchise opportunity, the award-winning product and full service offering – https://youtu.be/IfTDUU5NaPI. For more information about the franchise opportunity and RedBox+ Franchising, LLC, please visit https://franchise.redboxplus.com/. In 2018, RedBox+ Franchising, LLC acquired redbox+, the nation’s first and only roll-off waste container and portable restroom franchise. Founded in 2006 by Jeff Matejka, redbox+ was started with a hand-drawn sketch that soon evolved into obtaining an exclusive US patent for the innovative roll-off waste container and portable restroom combination. The response was immediate and the next year redbox+ received the “Innovation of the Year” award during the 2007 International Waste Expo. Today, redbox+ continues to grow as roofers, remodelers, home builders and more continue to take advantage of the cost-effective unique design. This sustainable growth is built on a steadfast business model, as evidenced by the recent acquisition by RedBox+ Franchising, LLC. As the only “one call, two services” solution in the $60 billion-dollar waste management industry, RedBox+ Franchising, LLC already has hundreds of containers operating in multiple cities across the country. With an aggressive and sustainable franchise development strategy in place, RedBox+ Franchising, LLC expects to grow to 100+ locations in the next 12 months. For more information about the franchise opportunity and RedBox+ Franchising, LLC, visit https://franchise.redboxplus.com/.